There’s no denying it: coming up with solid topic ideas for content and linkable assets on a consistent basis is hard work. Using keyword tools to unearth keyword ideas that are proven to drive traffic is one effective and time-honored method of topic discovery. Another is using popular questions to fuel content ideation. Leveraging Q&A-driven content is a high value strategy for few reasons. Sourcing popular questions means you’re targeting topics that have some level of inherent demand already, so the guesswork and much of the risk is eliminated. Problem-solving content is well-aligned with query intent, which equals a positive user experience, better engagement signals and a higher likelihood for sharing and links. An entire online empire of sites has been built on Q&A-driven content, which to me shows that the public is hungry for problem-solving content. So where and how do you find popular questions for your niche to build content around? Here are some ideas, which range from pedestrian to more advanced tactics. Let’s start by looking at some of the more popular question and answer sites, like Yahoo Answers, Quora, and even LinkedIn Answers. Hunting for content topic ideas (both from the questions as well as the answers) on these sites is a smart place to start, since these sites contain a wealth of ideas along with a variety of tools to help you bubble the more popular Q&A topics to the top. Quora is one of my favorite places for sourcing topics since it has some of the best resource boards and filtering options. So to start your research, you can use the Quora search box. This is more of a rudimentary approach, but it’s still a valuable tool for simple topic analysis. Like Google and YouTube auto-suggest, start typing in a keyword and Quora feeds you instant suggestions pulled from the latest question topic boards and answers based on your search terms. From there, you can find which question boards are getting the most activity for potential inspiration. You can also drill into the individual categories as a more targeted way to unearth ideas for a specific niche or vertical. To find a list of categories, go here. For a more granular breakdown of topics and subtopics, try this list. Pouring through those links will arm you with some great content ideas, especially from “the most followed unanswered questions,” which presents a great opportunity to fill a void and potentially market your content solution on Quora. For more Quora strategies, check out Kristi Hines’ excellent Quora Marketing guide. For more ideas on leveraging Yahoo Answers for content discovery, check out Arnie Kuenn‘s video on Using Yahoo Answers for Marketing. While not as frequented as Quora and Yahoo Answers for Q&A sourcing, LinkedIn Answers can be another great topic discovery tool. You can use the Advanced Answer Search feature to filter by keywords to get a big list of relevant topic ideas. You can also sort by “questions and answers” or “questions only” as well as by “show only unanswered questions” and use metrics such as total number of answers to determine demand, engagement and interest level. To me, “how-to” sites fall under the same conceptual umbrella as Q&A community-sourced sites. The questions aren’t explicitly stated necessarily, they’re implied. But the how-to content is basically an answer or solution to a common question. Examining the link profiles of sites like eHow and Wikihow for the most linked-to pages is yet another tactic for discovering popular content. For a task like this, you can use Open Site Explorer for link analysis. Grab your target URL, run a report, sort by “top pages” and by your favorite link metrics. OSE also shows key social metrics such Tweets, Facebook Likes, Google +1 data, so you’ve got a nice mix of KPIs you can use to signal what is (and isn’t) a popular topic. Another tip on leveraging a site like eHow is to dive into the HTML site maps section, which has layer after layer of subcategory sitemaps that all lead to big lists of all their articles on a particular topics. Take this blood pressure sitemap, for example. You can scrape the HTML from the source code and dump into the Buzzstream Free HTML Link Extractor and get back a CSV with 120 different topic ideas on blood pressure. Now, these raw sitemap scrapes don’t have any popularity or engagement metrics – other than the fact that eHow is publishing them, which may be evidence enough there’s demand. So if you want corresponding engagement KPIs, you can run individual URLs through OSE or hand that piece off to a virtual assistant on a services like oDesk, Mechanical Turk, eLance or Fiverr on the cheap (and focus your attention on higher impact tasks). Now, rather than manually scraping the SERPs, you can automate the process with a slick tool like the Link Prospector from Citation Labs. You can use the custom queries mentioned above or you can use the content research preset report in the tool that searches for “how-to” related content types. With this tactic, not only can you leverage the data to author content on your own site, but now you have a list of potential prospects to market your problem-solving content to. To get really personalized, you can pitch prospects on your list with the developing custom content for their site like a meaty guide, video, or leverage instructographic marketing to further illustrate their pain points in a graphic in exchange for your site getting cited as the source. For even more ways to prospect for linkable asset ideas, content marketing opportunities and “how-to” content, check out some of Garrett French’s series of articles on Search Engine Watch. Another great place to locate questions that are proven to drive traffic is your own analytics. Sure, a good chunk of that data is now concealed (thanks, Google…), but you can still find great question-driven queries in the exposed keyword data. What’s great about mining your own analytics is your working with proprietary data and performance metrics (conversions, social engagement metrics, etc) that are exclusive to your site, which offers a distinct advantage in that these questions are proven to drive traffic (and potentially conversions) to your site and nobody else has this data. Locating these keyword questions in analytics is pretty simple. Go to the advanced filtering section in your organic search dashboard (same goes for paid search), and filter by “how” and the “Five W’s“: who, what, where, when, why. Now, even though visitors have found your site using these search queries, it doesn’t necessarily mean you rank as well as you could, or that you have dedicated pages of content so it makes sense to take inventory of which question-driven queries are showing up on your site and which one’s need new content for. 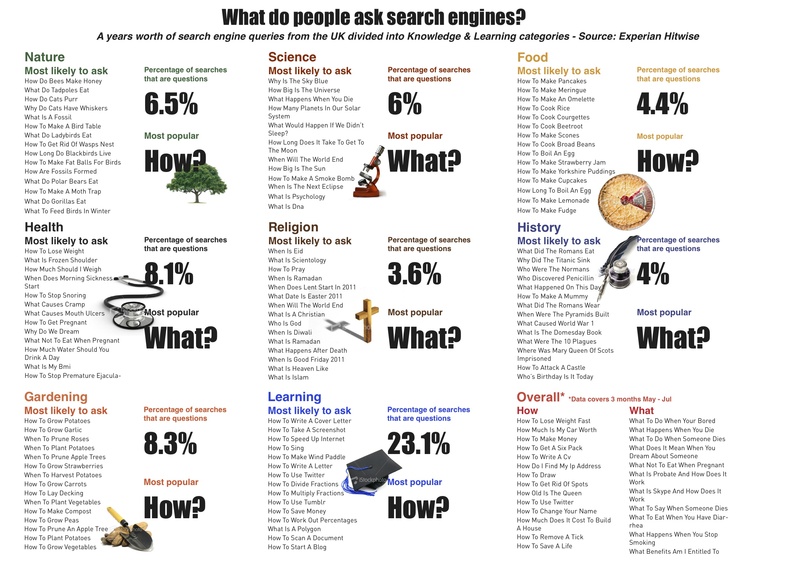 Finally, speaking of search engines, you can get even more question-driven content ideas by checking out this graphic for the top questions asked on search engines.